"A great cast delivers a wet twist on a Biblical myth. Exciting!" The Columbia Review. The original story, as told in the Bible, describes Noah as “ish tsadik tamim,” the Hebrew words for a man who is virtuous and innocent, or naive. In Russell Crowe’s interpretation, Noah is definitely not naive, hardly innocent, and not exactly virtuous. Rather, he is Russell Crowe as we know him from Gladiator or Robin Hood: a big and strong man who can take care of himself when things get nasty. He’s a man prone to violence, yet he is soulful in a self-doubting, spiritually-agonizing way that appeals to the leading lady. In other words, Crowe, as Noah, delivers on the promise of a mythical Biblical figure of super-human dimensions, but with the sensitivity that allows us to identify with him. The movie does not follow the tradition of The Ten Commandments or other films that retell a Biblical story in a way that’s loyal to the scriptures yet dramatized to keep modern viewers captivated. 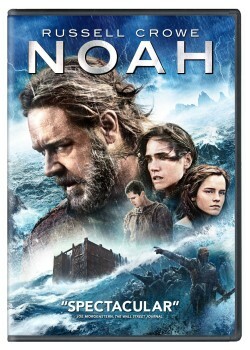 While this movie, like the Biblical story of Noah, does feature a flood, an arc and the demise of humanity, save Noah’s family, it veers far from the original in multiple ways. Added to the story are rocky monsters that operate (and sound) just like The Transformers, bad guys who looks like the Death Eaters from Harry Potter, and magical events (i.e. supplemental miracles that the Biblical version accidentally omitted). The main characters have the same names as Noah’s Biblical family, but the abundance of marital, parental and reproductive conflicts could easily be borrowed from a good old redneck family in rural America. However, despite its oddities, Noah delivers a captivating and enjoyable film, mainly because of its exceptionally talented cast of actors. Supporting Crowe is Jennifer Connelly, who rises to the challenge and is truly believable as a long-suffering, yet deeply loving wife, not to mention her enchanting beauty even in a faux Biblical attire and poor hygiene. Equally charming and believable is Emma Watson in a role of an adopted daughter and, later, a young mother. Watson is jettisoned from crisis to crisis requiring her to zigzag between extreme emotions, which she does without losing her edge even when the dizzying plot twists would have caused a lesser actor to break into uncontrolled giggling. Watson clearly has the making of a leading actor. Outside the core of Noah’s immediate family, Ray Winstone plays the king of the evil masses, who is loosely related to Cain of the original sin. Though too charming to truly convince us of his badness, Winstone fills the screen with his gruff, dominant presence whenever he’s up for action, which he does with characteristic gusto. And last but not least, Anthony Hopkins in a relatively minor role (of Noah’s very, very elderly grandfather) leaves a major impression, as only Hopkins can do. In summary, Noah is great entertainment. It brings to the screen a wonderful cast of excellent actors, embroils them in painful personal conflicts and exciting action, and charges the whole spectacle with the usual arsenal of breathtaking special affects. But all this might not be enough for everyone. For viewers seeking a faith-based movie to sweetly inspire the kids before Bible class, or those craving an emotional affirmation of the truthiness of theological dogma, this movie will cause severe apoplexies. Similarly, the movie’s frequent use of creationist lingo and the recurrent divine interferences (oh, the convenience of just-in-time miracles!) will make committed atheists lose their cool and hurl rebuttals at the screen. But for those who can leave politics and religion outside the theater and go in to watch a movie, suspend disbelief and have fun, Noah delivers aplenty.